We are raising this fund for Naveen, we have been together from past 14yrs, he is a very bright kid, just completed B.Com. Was about to start studying to become a Chartered Accountant. Due to some unfortunate events recently while playing he was injured around his neck and rushed to the hospital. That when we got to know that there is an inflammation of the spinal cord s5 and s6 also one of the disks had popped out. As of now, he is able to move his hands to a certain extent, he does not have any movements below his waist. Doctors have agreed to operate on him, giving time for us and his family to arrange the money. 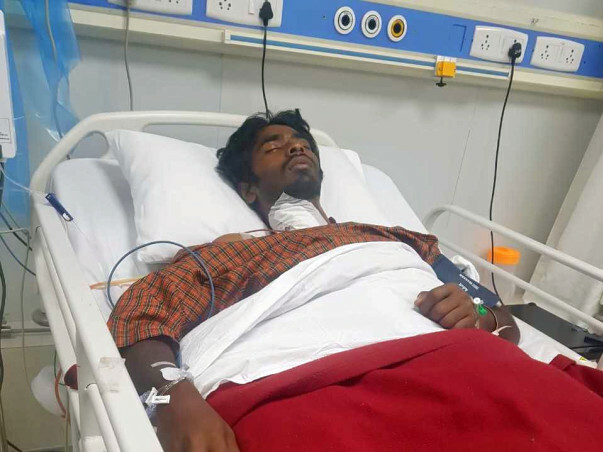 The family is not able to afford the complete cost of his operation and the medical expenses, as the brother-in-law is a cab driver and his sister is a housewife. Already they have spent about 30-35k on medicine. Whatever funds raised would be used to pay off the hospital bills and the remaining would be used for post-hospitalization expenses including his medicine and therapies. Thank you, Everyone, for your support. Surgery was a success, he is going through a rehabilitation process in NIMHANS. He will need to stay for another 6 months, Hope you guys can share to support his family.